After looking at some of the prime fantasy football bounceback candidates Wednesday, today we’re going the other way. Every year, the Oscars “In Memoriam” segment is popular, remembering film industry players who died in the previous year. And while this isn’t nearly so serious, consider this the fantasy In Memoriam. Remember these names fondly, because they were once top-flight fantasy contributors, but best bet is that those days are now behind them. Fitzgerald wasn’t helped by his team in 2018. The Cardinals had a new coach and a new quarterback. The team put up its lowest offensive grade (56.5) and run-blocking grade (55.8) and second-lowest pass-blocking grade (55.9) of the PFF era (2007-present). His Nos. 2 and 3 receivers from 2017, John Brown and Jaron Brown, were gone. They scored 225 points, their lowest total since they scored 210 in their 3-13 2000 season. All of that combined to take Fitzgerald down several pegs. But it all disguised that he wasn’t as good, either. He put up his second-worst grade ever, at 73.2. His yard per reception (10.6) was his second-lowest. His yards-after-catch average (3.1) was his second-lowest since 2007. Perhaps the biggest indicator of Fitzgerald (finally) aging, though, was his run-blocking. He has finished as a top-five receiver in run-blocking grades five times between 2006 and 2017, never putting up a lower run-blocking grade than 2017’s 71.4. In 2018? He was at 61.5. Fitzgerald is a Hall of Famer, but now, turning 36 before next season, his days as a top-flight fantasy receiver are over. Graham’s overall numbers in 2017 were buoyed by an unsustainable touchdown rate (10 scores on 92 targets and 57 receptions). While that was obviously going to fall in 2018, the light hope was that a pairing with Aaron Rodgers would help Graham rebound in other ways. Instead, his overall performance remained low (636 yards and a career-low 59.9 receiving grade despite playing all 16 games) and his touchdown percentage plummeted (2 on 83 targets and 55 receptions). 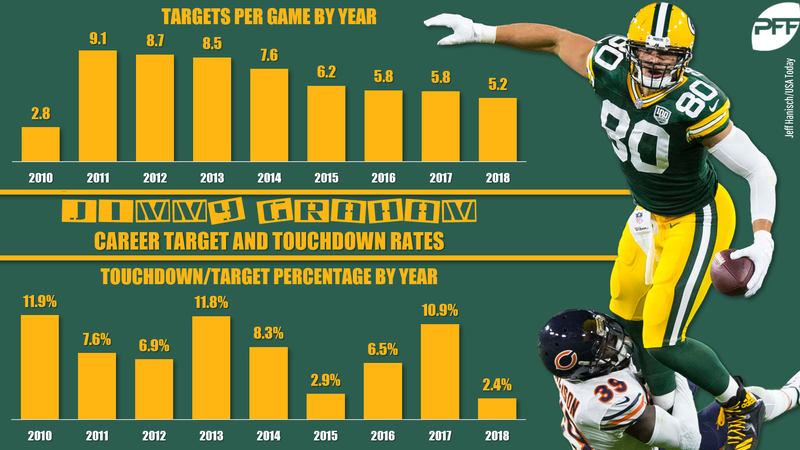 The Packers could save a chunk of the salary cap in 2019 by making Graham a post-June 1 cut, but even if they don’t, he’s just nowhere near the Graham he once was. Hyde signed as a free agent with the Browns last offseason, then lasted only six games in Cleveland before losing his gig to rookie Nick Chubb and being dumped to the Jaguars, where he totaled 58 carried and 189 scoreless rushing yards in eight games. The thing is, though, that his struggles have been going on for multiple years, only masked by the big workload he received in San Francisco and his short Cleveland tenure. His 3.3 per-carry average in Jacksonville was basically the same as his 3.4 in Cleveland, with the main difference being that he averaged more than 17 carries a game with the Browns and scored 5 times, compared to 7 a game with the Jaguars. Even in 2017 with the 49ers, his 58.0 overall grade was No. 62 out of 67 qualified running backs. Assuming he’s on a new team in 2019, maybe he stumbles into enough workload to be a flex play again, but that’s about it. The warning signs were all there for McCoy even after his largely quantity-based top-10 finish in 2017. His yards per carry dropped by more than a yard from 2016 (from 5.4 to 4.0), while his after-contact average dropped by more than a quarter-yard itself (2.42 to 2.14). In 2018, all those trends continued, with his yards per carry falling even further (3.2) and his after-contract average dropping as well (2.01), both to career-lows. 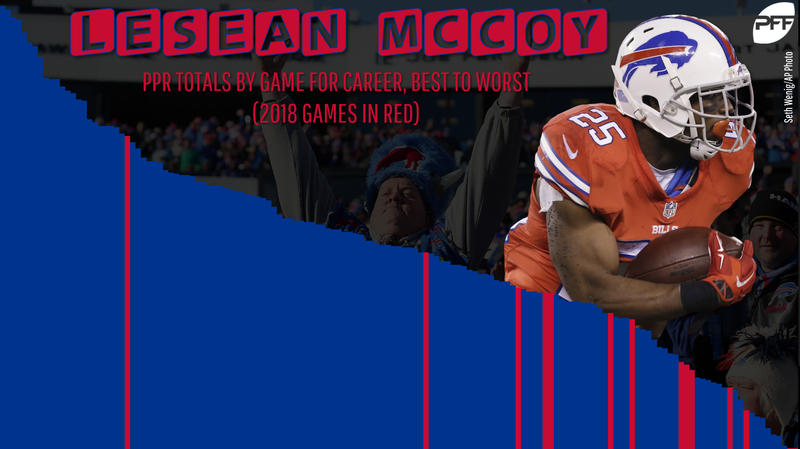 The decimation of the Bills’ offensive line didn’t help, but McCoy, who turns 31 before the next season, couldn’t rise above his line as he had in the past. The argument against McCoy’s warning signs was the fact that he was basically guaranteed a bell-cow workload in Buffalo, but even that didn’t help him. Olsen actually improved from 2017 to 2018 superficially, but only because he had injuries both years. Prior to that, he had been a top-10 PPR tight end every year 2012-2016. And because of injuries, I expect he’ll be considered a prime bounceback candidate in 2019, even at 34 years old. But I saw warning signs for Olsen before the injuries came knocking. Dating back to the Panthers’ bye in 2016 (26 games for Olsen), Olsen has two games with double-digit targets, one game over 100 yards, and only four games over 60. He had four touchdowns in five games this year, but even at that he had under 10 yards in two of those games. 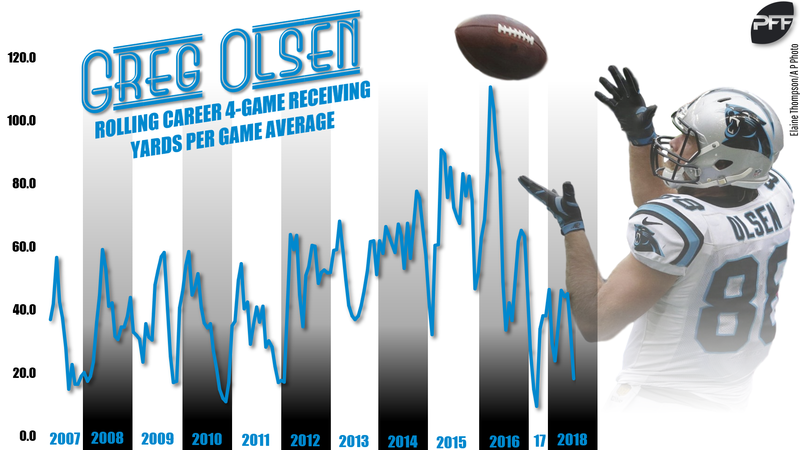 If healthy, Olsen will be relevant in 2019, just because the tight end position is such a disaster, but he’s not going to be the Greg Olsen he was. Obviously, everyone hopes Smith’s leg heals and he can make a full recovery. Whether that is in time for the 2019 season or not is immaterial. But the simple truth is that indications at this point are that he might struggle to be ready for the start of the season, and even if he is, he’ll be a 35-year-old quarterback coming off his worst year in a decade who could suffer from sapped mobility because of the injury. Smith put up his lowest yards per attempt since 2009 and his worst passer rating since 2010 in his first season in Washington, and barring a complete revamp of the team’s offensive depth chart, he won’t have the weapons in 2019 to overcome that even if he is healthy. 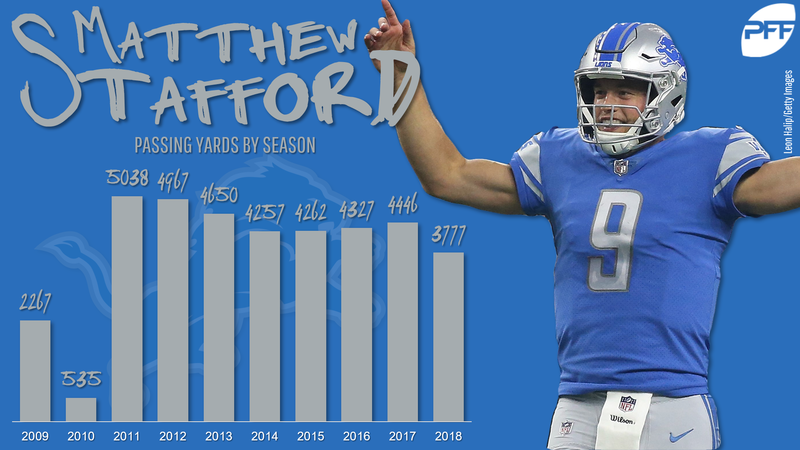 The trade of Golden Tate and the injury to Marvin Jones didn’t help matters, but Stafford was a worse quarterback on his own in 2018. It was his first year under 4,000 passing yards since his injury-abbreviated 2010, with his fewest passing touchdowns (21) since 2012 and his lowest passer rating (89.9) since 2014, even as passing numbers were skyrocketing around the league. Most tellingly, though, is the Lions bringing in run-heavy offensive coordinator Darrell Bevell as offensive coordinator to go along with ball-control-stressing head coach Matt Patricia. With Kerryon Johnson the best running back Stafford has had since at least the Reggie Bush/Joique Bell era (if ever), the days of Stafford throwing for 4,500-plus yards are over. The obvious reason for Thomas not to bounce back is his injury; he tore his Achilles in Week 16, an injury that often takes longer to recover than he’d need to return in time for the start of 2019. A prime cut candidate for the Texans, Thomas is likely to be a 31-year-old free agent just looking for a soft place to land coming off a yearlong injury and two seasons of deterioration. He’s no longer a fantasy-relevant name.